The iPhone 7 and 7 Plus have only been available in Australia since September, but that hasn’t stopped the rumours and speculation about the highly anticipated iPhone 8. Since 2007, Apple has redefined the smartphone market, selling more than one billion iPhones. Despite this, sales dipped last year for the first time since the iPhone launched, blamed in part due to smartphone market saturation and, the lack of revolutionary new features on the iPhone 7 apart from the removal of the headphone jack. This year, big things are expected of the iPhone 8, which will be launched on the 10th anniversary of the first iPhone. 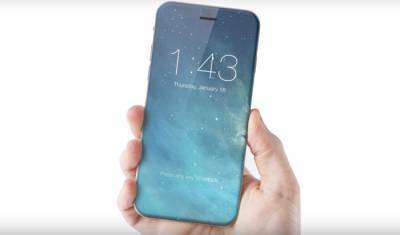 Here are some of the most common rumours about the iPhone 8 release date, features and specifications. One of the most popular rumours about the upcoming iPhone is that that the new iPhone screen will run from edge to edge and top to bottom, removing the top and bottom framing bezels, where the front-facing camera and home buttons are located. According to the rumour mill, the home button will become a virtual, on screen button where touch ID and the front-facing camera will be built directly into the display. With an edge-to-edge design, the display would take up the entire front of the iPhone, however at this stage Mac Rumours state that it is unclear whether or not the display will increase in size to fit the iPhone, or whether the iPhone will be shrunken down to fit the display. Rather than an LCD display, it’s rumoured that the newest iPhone display will use a newer technology called organic light-emitting diode (OLED). OLED screens are typically more flexible, consume less power and offer a better display where colours appear brighter. Banking company JP Morgan has come across a purchase order in Apple’s most recent Securities and Exchange Commission which is thought to be for OLED panels. The order which extends for a year and is valued at around $4bn, means an OLED display on the new iPhone is very probable. While Apple has improved the iPhone’s screen somewhat in recent years, the iPhone’s screen resolution of 750 pixels by 1,334 pixels has not changed since the iPhone 6. If the OLED rumour is true, users will see a significant improvement in screen display. While rumours have been heavily focused on the design of the iPhone 8, it is expected that the newest iPhone will have a 10-nanometer A 11 chip that will be faster and more efficient than older models. In addition, rumours suggest that it could include features such as long-range wireless charging, known as inductive charging. This technique would enable users to charge their phone without any cables, so long as the device is in contact with a charging stand or mat. With the exception of the iPhone SE, which Apple launched in March 2016, Apple has a long-running tradition of launching its latest iPhones in the month of September. While it is highly likely the iPhone 8 will be available in September this year, 2017 does mark the 10th anniversary of the original iPhone launch, meaning Apple may mix it up this year.